On the face of it, quantum effects and living organisms seem to occupy utterly different realms. The former are usually observed only on the nanometre scale, surrounded by hard vacuum, ultra-low temperatures and a tightly controlled laboratory environment. The latter inhabit a macroscopic world that is warm, messy and anything but controlled. A quantum phenomenon such as ‘coherence’, in which the wave patterns of every part of a system stay in step, wouldn’t last a microsecond in the tumultuous realm of the cell. Or so everyone thought. But discoveries in recent years suggest that nature knows a few tricks that physicists don’t: coherent quantum processes may well be ubiquitous in the natural world. Known or suspected examples range from the ability of birds to navigate using Earth’s magnetic field to the inner workings of photosynthesis — the process by which plants and bacteria turn sunlight, carbon dioxide and water into organic matter, and arguably the most important biochemical reaction on Earth. Researchers have long suspected that something unusual is afoot in photosynthesis. Particles of light called photons, streaming down from the Sun, arrive randomly at the chlorophyll molecules and other light-absorbing ‘antenna’ pigments that cluster inside the cells of every leaf, and within every photosynthetic bacterium. But once the photons’ energy is deposited, it doesn’t stay random. Somehow, it gets channelled into a steady flow towards the cell’s photosynthetic reaction centre, which can then use it at maximum efficiency to convert carbon dioxide into sugars. Since the 1930s, scientists have recognized that this journey must be described by quantum mechanics, which holds that particles such as electrons will often act like waves. Photons hitting an antenna molecule will kick up ripples of energized electrons — excitons — like a rock splashing water from a puddle. These excitons then pass from one molecule to the next until they reach the reaction centre. But is their path made up of random, undirected hops, as researchers initially assumed? Or could their motion be more organized? Some modern researchers have pointed out that the excitons could be coherent, with their waves extending to more than one molecule while staying in step and reinforcing one another. If so, there is a striking corollary. Coherent quantum waves can exist in two or more states at the same time, so coherent excitons would be able to move through the forest of antenna molecules by two or more routes at once. In fact, they could simultaneously explore a multitude of possible options, and automatically select the most efficient path to the reaction centre. Four years ago, two teams working under Graham Fleming, a chemist at the University of California, Berkeley, were able to obtain experimental proof to back up this hypothesis (See ‘Quantum fact meets fiction’). One team used a string of very short laser pulses to probe the photosynthetic apparatus of the green sulphur bacterium Chlorobium tepidium1. The researchers had to chill their samples to 77 K with liquid nitrogen, but the data from their laser probes showed clear evidence of coherent exciton states. The second team carried out a similar study of the purple bacterium Rhodobacter sphaeroides2, and found much the same electronic coherence operating at temperatures up to 180 K.
In 2010, researchers from the first group published evidence of quantum coherence in their bacterial complex at ambient temperatures3 — showing that coherence is not just an artefact of cryogenic laboratory conditions, but might actually be important to photosynthesis in the real world. Around the same time, a team led by Gregory Scholes, a chemist at the University of Toronto in Canada, also reported coherence effects at ambient temperatures4 — this time not in bacteria, but in photosynthetic cryptophyte algae, evolutionarily distinct organisms that are more closely related to plants and animals, and that use completely different light-absorbing chemical groups. But how can quantum coherence last long enough to be useful in photosynthesis? Most physicists would have assumed that, at ambient temperatures, the surrounding molecular chaos in the cell destroys the coherence almost instantly. Computer simulations carried out by Lloyd and some of his colleagues suggest an answer: random noise in the environment might actually enhance the efficiency of the energy transfer in photosynthesis rather than degrade it5. It turns out that an exciton can sometimes get trapped on particular sites in the photosynthetic chain, but simulations suggest that environmental noise can shake it loose gently enough to avoid destroying its coherence. In effect, says Lloyd, “the environment frees up the exciton and allows it to get to where it’s going”. Photosynthesis is not the only example of quantum effects in nature. For instance, researchers have known for several years that in some enzyme-catalysed reactions6, protons move from one molecule to another by the quantum-mechanical phenomenon of tunnelling, in which a particle passes through an energy barrier rather than having to muster the energy to climb over it. And a controversial theory of olfaction claims that smell comes from the biochemical sensing of molecular vibrations — a process that involves electron tunnelling between the molecule responsible for the odour and the receptor where it binds in the nose7. Are such examples widespread enough to justify a whole new discipline, though? Robert Blankenship, a photosynthesis researcher at Washington University in St Louis, Missouri, and a co-author with Fleming on the C. tepidium paper, admits to some scepticism. “My sense is that there may well be a few cases, like the ones we know about already, where these effects are important,” he says, “but that many, if not most, biological systems will not utilize quantum effects like these.” But Scholes believes that there are grounds for optimism, given a suitably broad definition of quantum biology. “I do think there are other examples in biology where an understanding at the quantum-mechanical level will help us to appreciate more deeply how the process works,” he says. One long-standing biological puzzle that might be explained by exotic quantum effects is how some birds are able to navigate by sensing Earth’s magnetic field. The avian magnetic sensor is known to be activated by light striking the bird’s retina. Researchers’ current best guess at a mechanism is that the energy deposited by each incoming photon creates a pair of free radicals8 — highly reactive molecules, each with an unpaired electron. Each of these unpaired electrons has an intrinsic angular momentum, or spin, that can be reoriented by a magnetic field. As the radicals separate, the unpaired electron on one is primarily influenced by the magnetism of a nearby atomic nucleus, whereas the unpaired electron on the other is further away from the nucleus, and feels only Earth’s magnetic field. The difference in the fields shifts the radical pair between two quantum states with differing chemical reactivity. “One version of the idea would be that some chemical is synthesized” in the bird’s retinal cells when the system is in one state, but not when it’s in the other, says Simon Benjamin, a physicist at the University of Oxford, UK. “Its concentration reflects Earth’s field orientation.” The feasibility of this idea was demonstrated in 2008 in an artificial photochemical reaction, in which magnetic fields affected the lifetime of a radical pair9. Benjamin and his co-workers have proposed that the two unpaired electrons, being created by the absorption of a single photon, exist in a state of quantum entanglement: a form of coherence in which the orientation of one spin remains correlated with that of the other, no matter how far apart the radicals move. Entanglement is usually quite delicate at ambient temperatures, but the researchers calculate that it is maintained in the avian compass for at least tens of microseconds — much longer than is currently possible in any artificial molecular system10. This quantum-assisted magnetic sensing could be widespread. Not only birds, but also some insects and even plants show physiological responses to magnetic fields — for example, the growth-inhibiting influence of blue light on the flowering plant Arabidopsis thaliana is moderated by magnetic fields in a way that may also use the radical-pair mechanism11. But for clinching proof that it works this way, says Benjamin, “we need to understand the basic molecules involved, and then study them in the lab”. He points out that it isn’t obvious why selection would favour coherence. “Almost all photosynthetic organisms spend most of the day trying to moderate light-harvesting. It is rare to be light-limited. So why would there be evolutionary pressure to tweak light-harvesting efficiency?” Fleming agrees: he suspects that quantum coherence is not adaptive, but is simply “a by-product of the dense packing of chromophores required to optimize solar absorption”. Scholes hopes to investigate the issue by comparing antenna proteins isolated from species of cryptophyte algae that evolved at different times. But even if quantum coherence in biological systems is a chance effect, adds Fleming, its consequences are extraordinary, making systems insensitive to disorder in the distribution of energy. What is more, he says, it “enables ‘rectifier-like’ one-way energy transfer, produces the fastest [energy-transfer] rate, is temperature-insensitive and probably a few other things I haven’t thought of”. These effects, in turn, suggest practical uses. Perhaps most obviously, says Scholes, a better understanding of how biological systems achieve quantum coherence in ambient conditions will “change the way we think about design of light-harvesting structures”. This could allow scientists to build technology such as solar cells with improved energy-conversion efficiencies. Seth Lloyd considers this “a reasonable expectation”, and is particularly hopeful that his discovery of the positive role of environmental noise will be useful for engineering photonic systems using materials such as quantum dots (nanoscale crystals) or highly branched polymers studded with light-absorbing chemical groups, which can serve as artificial antenna arrays. Another area of potential application is in quantum computing. The long-standing goal of the physicists and engineers working in this area is to manipulate data encoded in quantum bits (qubits) of information, such as the spin-up and spin-down states of an electron or of an atomic nucleus. Qubits can exist in both states at once, thus permitting the simultaneous exploration of all possible answers to the computation that they encode. In principle, this would give quantum computers the power to find the best solution far more quickly than today’s computers can — but only if the qubits can maintain their coherence, without the noise of the surrounding environment, such as the jostling of neighbouring atoms, destroying the synchrony of the waves. But biology has somehow solved that challenge: in effect, quantum coherence allows a photosystem to perform a ‘best-path’ quantum computation. Benjamin, whose main interest is in designing materials systems for quantum computation and information technology, sees the ambient-temperature avian compass as a potential guide. 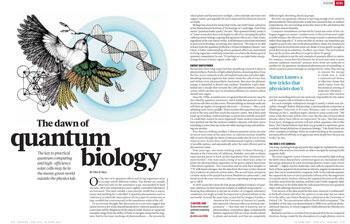 “If we can figure out how the bird’s compass protects itself from decoherence, this might just give us a few clues in the quest to create quantum technologies,” he says. Learning from nature is an idea as old as mythology — but until now, no one has imagined that the natural world has anything to teach us about the quantum world.